Whether you have 2, 20, or 200 employees, Ooma Office has everything you need in a business phone. We’re so confident you’ll love us, we don’t worry about contracts. Scaling your phone system is easy through the web admin, and your monthly cost per user never increases. Our Mobile App allows all of your on-the-go workers to use and manage their business phone calls from their smart phone. Our web admin allows you to easily assign conference line numbers, call routing preferences, and more. 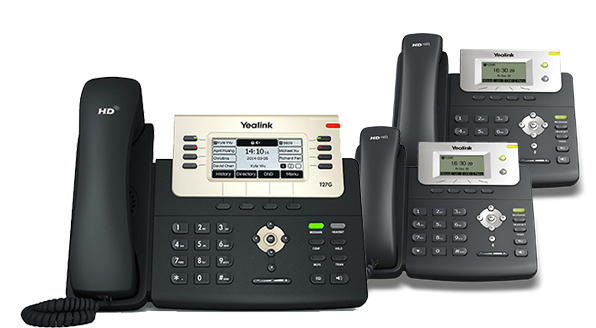 Our VoIP phones are plug-and-play. All you need to do is take the phone out of the box and plug it in, and you’ll be up and running in minutes. We offer 35+ VoIP phone features designed specifically for small business. No matter how many users, the Ooma Office monthly service cost per user is always $19.95/month. Call 877-959-6662 today! Sophisticated technology meets elegant design. The Ooma Office is no dumb adapter. It’s actually a small, networked-managed, secure Linux computer packed with processing power to keep your calls clear and reliable. 1. Ooma is a full router capable of prioritizing voice data and directing traffic to ensure the most reliable phone service. 2. A USB port provides future expansion opportunities. 3. DECT radio supports up to 4 Linx remote phone jacks. 4. Built-in 1.2GHz dual-core processor provides the power for Ooma PureVoice™ for more clear and reliable phone calls. 5. 1 GB NAND Flash with dual system image for the ultimate in reliability and upgradability to new services. How do Ooma business phones work? Ooma Office uses your high-speed internet connection, also known as VoIP (voice over IP) to connect calls. Our business VoIP phones use the cloud to deliver the advanced features and quality of service you’d expect from an enterprise-grade phone system without complex installations. It’s natural to have questions. Call our consultants at 877-959-6662 today. Get our VoIP phone adapter with 2 wireless extensions. It is compatible with any analog phone.